Posted on July 10, 2014 in News. This has to be the best way to leave your tired, bored passengers with a lovely smile on their faces! Heavy thunder and lightening struck in Denver late Monday night, forcing the plane to be diverted to Cheyenne where they sat, stuck for hours. 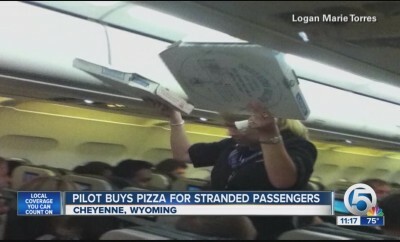 He gave the local Dominos pizza a call. He informed them that he needed to feed 160 people ASAP! 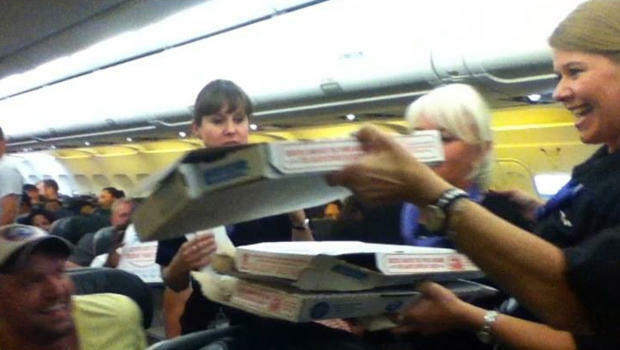 About 35 pizzas arrived within 30 minutes – half cheese, half pepperoni – and were handed out by the airline staff following an eruption of applause from all those on board. Bradner just wanted to make sure that his passengers enjoyed the flight with a smile on their faces. The captain had been so kind as to pay for the whole lot out of his own pocket. However, he soon got a call from the president of the airline letting him know that he would be reimbursed for the cost. Now this is a flight I wouldn’t have minded being stuck on!